New York City's Metropolitan Transportation Authority said this month it would begin putting mounted placards on subway cars and buses, including: "Dude ... Stop the Spread, Please." SEATTLE - Seattle, annoyed by selfish public transit riders who take up more than their share of space, has launched a transit manners campaign against so-called "manspreading," the practice of riders draping their legs across neighboring seats. Joining a number of cities that have taken action, including Philadelphia, bus-and-train operator Sound Transit will add mounted placards in January featuring side-by-side drawings of an octopus, one with its tentacles rudely stretched onto a bordering seat and the other with them correctly clutched and dangling at its front. "We agree, one body, one seat. No #manspreading," the agency Tweeted on Jan. 13 in response to a female passenger who reported standing-room only on a light-rail commuter train and two men who were "blithely spreading." The space-violating scourge of urban travel has sparked shame-inducing outrage backed by photo evidence on blogs and Twitter from wary female subway passengers to stodgy etiquette experts in U.S. cities and beyond, including Toronto, London and Istanbul. New York City's Metropolitan Transportation Authority said earlier this month it would begin putting mounted placards on subway cars and buses, including: "Dude ... Stop the Spread, Please" and "Keep Your Stuff to Yourself." 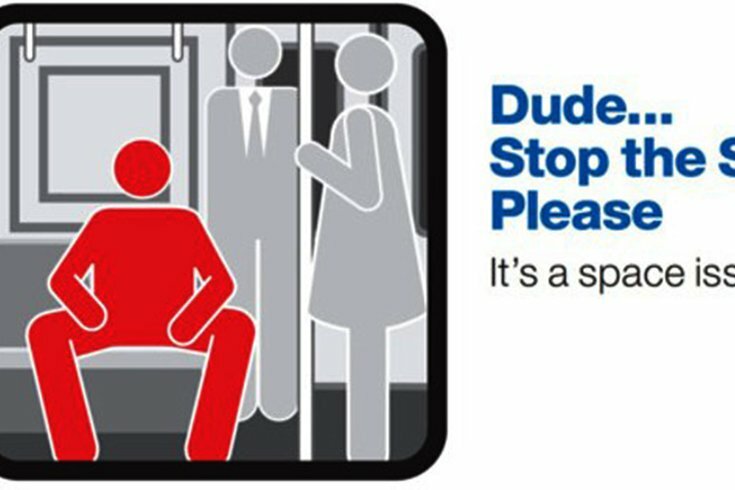 In Philadelphia, the SEPTA's 2014 "Dude It's Rude" passenger-etiquette campaign used social media and placards to promote "common courtesy for your fellow passengers," said spokeswoman Heather Redfern. "Some of you may remember the last systemwide campaign that took a lighter approach with cartoon-like characters," the agency said on its website. "Unfortunately we found that the messaging was too soft and we didn't see much change in overall behavior." Last year, in Turkey, the Istanbul Feminist Collective sought to narrow jutting v-shaped legs through its campaign "Stop spreading your legs ... Don't occupy my space", which was so popular it made Twitter trending lists. Sound Transit's campaign intends to discourage manspreading and other behaviors it deems rude, like using an adjacent seat as a footrest or scattering luggage on other seats and in the aisle, said Bruce Gray, a spokesman.